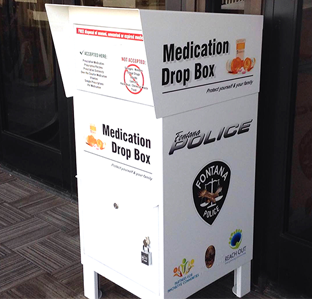 Prescription Drop Boxes are safe places where you can drop off expired or prescription drugs that you no longer use. The goal of these boxes is to provide a safe, convenient and responsible way of disposing of prescription drugs. Dispose of prescription drugs responsibly and help prevent misuse/and or drug abuse. Prescription medications patches or ointments, over-the-counter medications, vitamins, medication samples and (select) pet medicines. Hydrogen peroxide, inhalers/aerosol cans, non-prescription ointments, liquids or lotions, bloody or infectious waste, sharps (needles) and thermometers. View the Prescription Drug Drop Box Locations. Please visit the San Bernardino County Fire Department website to locate a Household Hazardous Waste (HHW) collection facility that accepts home-generated sharps/needles in approved containers from San Bernardino County residents. View the Guide to Sharps Disposal.